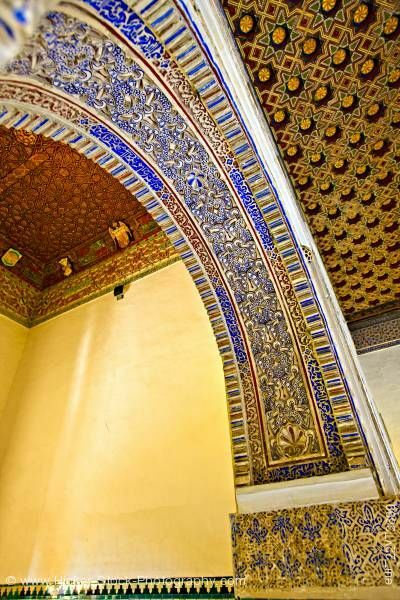 Stock photo of the tiled archway and ceiling of the Patio de las Munecas, Palacio Mudejar, Reales Alcazares - UNESCO World Heritage Site, Santa Cruz District, City of Sevilla, Province of Sevilla, Andalusia, Spain, Europe. Colorful detailed worn tiles of an archway and ceiling of the Patio de las Munecas, Palacio Mudejar. This stock photo shows the Patio de las Munecas, Palacio Mudejar, Reales Alcazares - UNESCO World Heritage Site, Santa Cruz District, City of Sevilla, Province of Sevilla, Andalusia, Spain, Europe. Colorful detailed worn tiles are shown throughout. The archway shows tiles in brown, yellow, blue and white in a swirling pattern and the same colors are stripes on each side. The ceiling to the right of the arch is tiled in a flower pattern of brown, yellow, gold, and green. The ceiling to the left of the arch has tiles of brown, red green and yellow is a darker flower type pattern. The tile also is a border around the top of the wall with a green trim. The sunlit wall below is a light tan. Patio de las Munecas (Patio of the Dolls), Palacio Mudejar, Reales Alcazares (Royal Palaces) - UNESCO World Heritage Site, Santa Cruz District, City of Sevilla (Seville), Province of Sevilla, Andalusia (Andalucia), Spain, Europe.